Labels are guided through the fork. An ultrasonic transmitter in the lower leg of the fork beams a fast sequence of pulses through the backing material. The sound pulses cause the backing material to vibrate such that a greatly attenuated sound save is beamed from the opposite side. The receiver in the upper leg of the fork receives this sound wave. 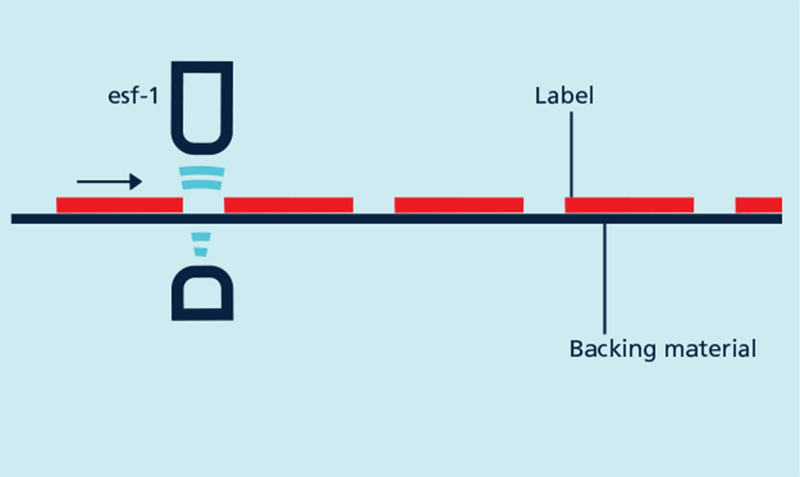 The backing material transmits a different signal level from the label. This signal difference is evaluated by the esf-1. The signal difference between the backing material and the label can be very slight. To ensure a reliable distinction, the esf-1 has to learn the label. can reliably detect high-transparency, reflective materials as well as metallised labels and labels of any colour. The measurement cycle time automatically self-adjusts to the sound power required. 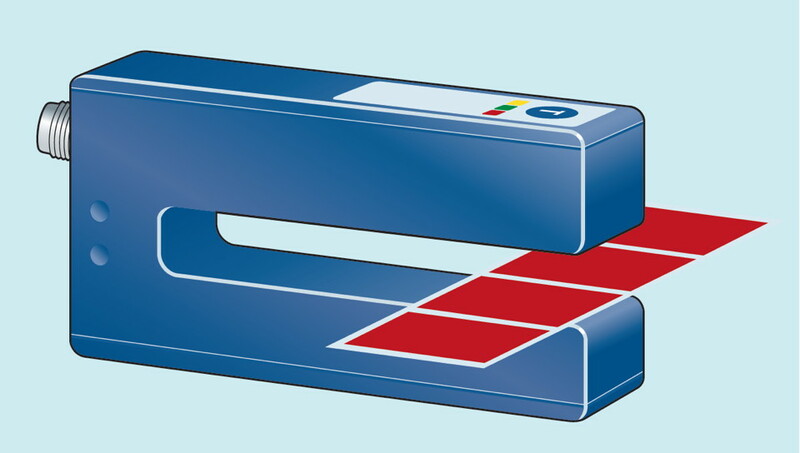 For thin labels and backing materials, the esf-1 can work at its maximum speed, with a response time of < 300 µs. To be able to detect special labels, for example labels with punches or perforations, there are three different Teach-in methods available. During the Teach-in process, the backing material and its labels are guided through the fork at a constant speed. The esf-1 sensor automatically learns the signal level for the labels and for the gaps between the labels. This is the standard Teach-in for labels. The signal level difference for the backing material and labels might be very slight. 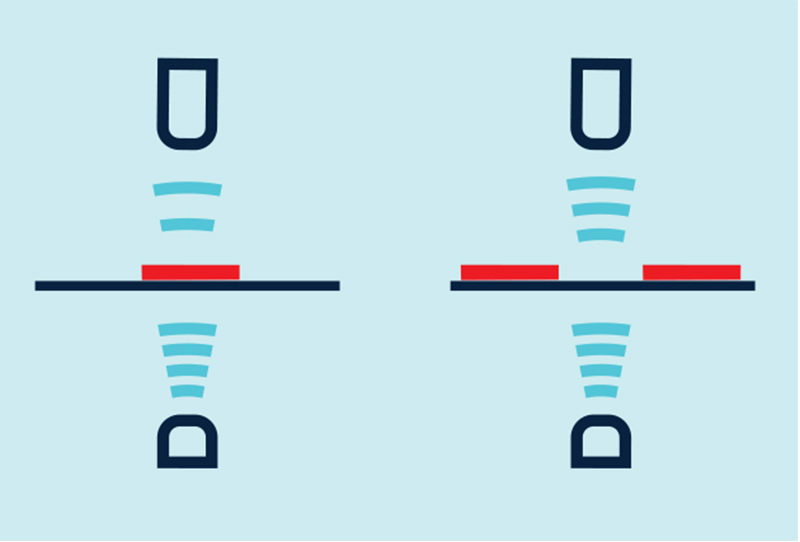 In order to still scan labels with very little difference in signals, Teach-in for the signal levels is done separately: Teach-in is first done for the backing material and then for the label on it. The switching threshold then lies between these two signal levels. Web material is generally processed from a roll. The splice to be detected is hidden somewhere in the roll. There is a separate Teach-in method available for this purpose, in which only the sheeting is learned. 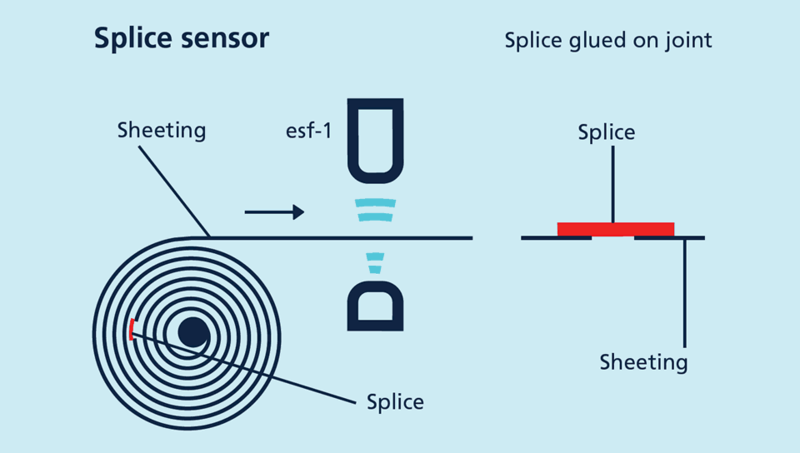 The esf-1 detects the level difference at the splice and sets its output. can optionally be carried out with the button on the top of the housing or with pin 5 on the unit's connector. the esf-1 learns the material for the duration that the button is pushed or pin 5 is controlled. the esf-1 can optionally be parameterised. Measured values can also be shown graphically. Labels are guided through the fork. The esf-1 reacts to the signal difference between the backing material and the label.